Less than 30 people attended the Sleeping Giants/Getup! protest outside the Sydney Convention Centre on March 20. The reputation of social media and its ability to change the world has suffered some recent setbacks. First came the revelation by Andrew Burrell in The Australian that a fearsome protest movement against the News Corp TV channel Sky News urging advertisers to boycott the station because of its alleged “racism, bigotry, misogyny and abuse of women”, was little more than one academic in Perth with a Twitter account. Burrell found the Edith Cowen University accounting lecturer was spending his time at work writing up to 100 Tweets a day on behalf of anonymous activist group, Sleeping Giants, denigrating Sky advertisers and threatening to never buy their products. Second was the cancellation of a proposed Sleeping Giants protest outside Sky News studios in Sydney because no one came. Instead, its organisers decided to join a Get Up! 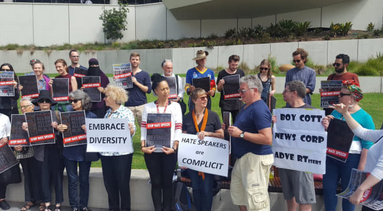 rally outside News Corp’s Come Together presentation to advertisers at the Sydney Convention Centre last Wednesday. They urged those inside to stop spending with Rupert Murdoch’s organisation because of its “divisive” news coverage. However, photographs of the event in trade paper Adnews show that less than 30 people turned up to display their wrath. In other words, these and other Leftist campaigns in the social media, with their claims about “going viral” and attracting huge audiences of supporters, are very often pure bluff, merely the work of a handful of anonymous activists who, thanks to public sector jobs or Centrelink payments, have plenty of time during the day to throw their fake weight around. How dare she rile savages!